The redox potential is used to describe a system's overall reducing or oxidizing capacity. The Standard Hydrogen Electrode (SHE) is the 0.0V thermodynamic reference point for all potential measurements at all temperatures. 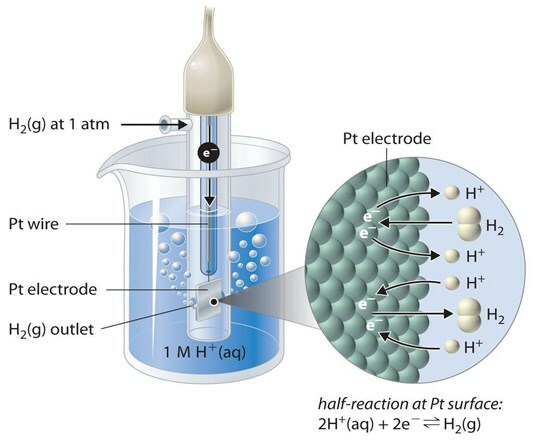 The potential of a half-reaction measured against the SHE under standard conditions is called the standard electrode potential for that half-reaction. E° values do not depend on the stoichiometric coefficients for a half-reaction. Usually, in chemistry, the Mg is more reactive than Cu, so the first reactions must occur much faster than the second. Let's understand why. 2 H+(aq) + 2e- → H2(g) at 25 °C. A salt bridge is used to connected the two half cells. The reason why platinum is used for the SHE is because it is corrosion-resistant, it catalyzes the proton reduction reaction, has a high intrinsic exchange current density, and yields reproducible results. Also is used to insure a large electrochemical surface area and rapid equilibrium conditions. The redox reaction takes place at the platinized platinum electrode. When the electrode is dipped into the acidic solution, hydrogen gas bubbles through it. The concentration of the reduced and oxidized form is maintained, so the pressure of hydrogen gas is 1 bar or 100 kPa. 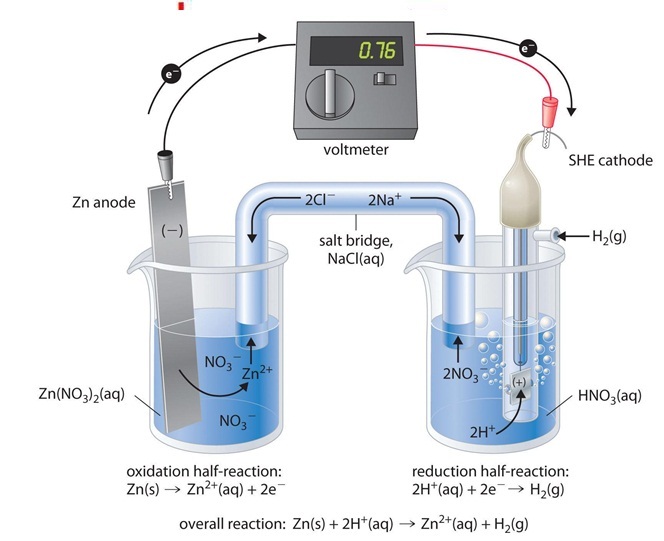 The standard hydrogen electrode is then attached to the electrode system you are investigating - for example, a piece of Zn in a solution containing Zn ions (Figure 2). The whole of this set-up is described as a cell. It is a simple system which generates and measures a voltage. Each of the two beakers are called half cells. As you can see, the half cells are connected by a salt bridge (NaCl in this case). The salt bridge is needed to complete the electrical circuit without introducing any more bits of metal into the system The ends are "stoppered", usually by cotton wool. This stops too much mixing of the contents of the salt bridge with the contents of the two beakers. The electrolyte in the salt bridge is chosen so that it doesn't react with the other chemicals. When we close the circuit, the voltmeter indicates a potential of 0.76 V. What happens is that the zinc electrode begins to dissolve to form Zn2+, and in the other cell H+ ions are reduced to H2 . Thus the hydrogen electrode is the cathode, and the zinc electrode is the anode. why Mg is more reactive than Cu, so why the first reaction happens faster? If we replace the Zn half cell with a Mg one we will obtain a V = 2.37 and the voltmeter would show the magnesium as the negative electrode and the hydrogen electrode as being positive. If we replace with a Cu one we will find a value of V= 0.34, which means that there will be less build-up of electrons on the copper than there is on the platinum of the hydrogen electrode, when compared with the Mg one. A change is that this time the copper is the more positive (less negative) electrode. The voltmeter will show the hydrogen electrode as the negative one and the copper electrode as positive. It is also important to notice that standard electrode potentials for half-reactions are intensive properties and do not depend on the amount of substance involved. This is because electrical potential is the energy needed to move a charged particle in an electric field, and consequently, E° values are independent of the stoichiometric coefficients for the half-reaction.